You might wonder if Paris really needed another luxury hotel? And, if so, how it possibly could find a niche among the classical houses and the more modern versions of the old palaces? But yes, there is a niche and there was one thing missing: the Mandarin Oriental. Here it is: the Mandarin Oriental, the first in France of the Asian group, the epitome of elegance, understatement and service. It’s a brand new Hotel located in an Art Deco building on rue Saint-Honoré, only a stone’s throw away from place Vendôme. It’s a posh area, right, but it’s also historical ground. Over the decades this has been the side of a Capuchin monastery, a hippodrome, a theatre and even a royal riding school. Now it will be the Parisian pied a terre for the happy few. This is, of course, not an old Grand Hotel. You don’t check in here, because James Joyce ore Thomas Mann were regulars. The building dates from the Thirties, it’s listed, and French star-architect Jean-Michel Wilmotte supervised the renovation. I would agree with you if you think that the facade looks a bit chilly. But it’s worth walking in just to explore the place. Or why not directly check in as early bird? 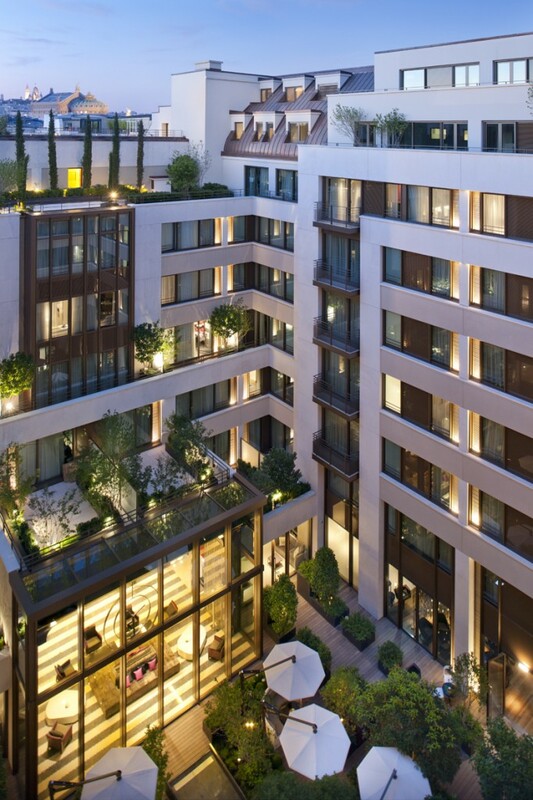 To celebrate its opening Mandarin Oriental is offering an introductory J’aime Paris promotion. Available from 17 July to 28 August 2011. Each reservation includes a cash credit of EUR 300 for any room reservation, or EUR 500 for suite reservations. These credits can be redeemed on rooms or at the spa, bar or one of the restaurants. A minimum length of stay may be required on certain dates. Once inside, you quickly get the idea. 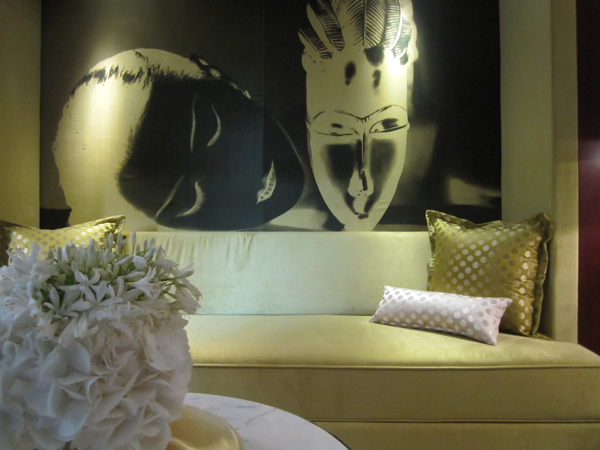 The Mandarin Oriental is resolutely modern, resolutely elegant and, surprise, surprise, resolutely feminine. 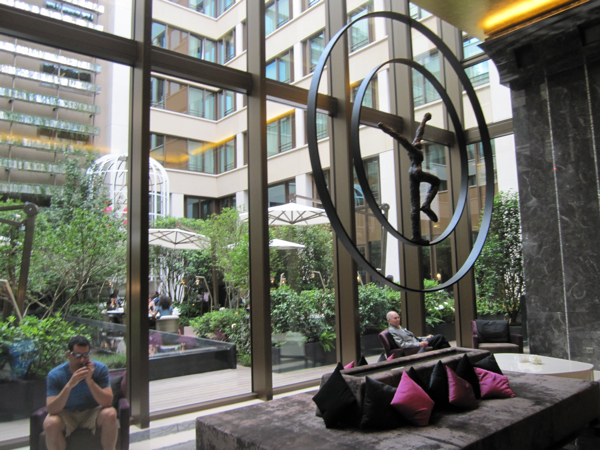 In the lobby, a piece of art hovers over the guests' heads, immediately drawing your gaze: a bronze man walking in two bronze circles, it’s called Air (by the French sculptor Nathalie Decoster) – and air is what you find in this hotel. Rooms and suites are some of the city's most spacious. 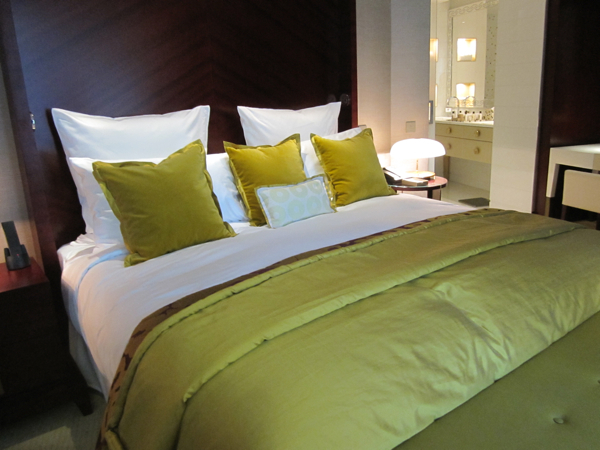 Regular rooms start at 37 square metres and the largest suite, the Suite Royal Mandarin, fills 350 sq m on two levels. Can you imagine the terrace overlooking the city from the Garnier Opera to the Eiffel Tower? And in case this is not big enough for you, adjoining doors transform the Suite Royal Mandarin and the other suites located on the top floor into the biggest suite in Paris, measuring 1,000 square metres. What is different compared to classical luxury hotels like the George V or the Crillon? Well, the George V and the Crillon, they are old money. This is for new money. It’s a non-ostentatious idea of luxury. I would even say the Mandarin Oriental is as non-ostentatious as the Park Hyatt, but, to be very honest, it offers more: a bigger, lovelier spa, with its 900 square metres is one of the city's largest hotel spas actually; a garden of nearly 500 square metres, planted with trees and flowers, including camellias; a restaurant called “Sur mésure” with a chef de cuisine, Thierry Marx, who will not waste any time before snatching three stars (again) from Michelin. And it is, indeed, very feminine it its style. 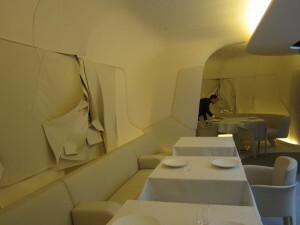 Interiors are designed by Sybille de Margerie. Colours are sober, but fresh though. There are a lot of feminine quotations too: you’ll find photos of Man Ray copied into alcoves or over beds. There are a lot of art works, portraits by photographer Ali Mahdavi inspired by Hollywood women of the thirties. And if you look around you will discover butterflies all over, an animal symbolizing metamorphosis and rebirth and therefore perfectly fitting into this new spot. Might this be the first luxury hotel for businesswomen on a trip to Paris, a palace nestled on one of the most luxurious shopping streets in the world? Could be that very successful women like Ophra Winfrey, Christine Lagarde or Michelle Obama will take up quarters here. Last but not least let’s talk environment: the mandarin Oriental is the first luxury hotel in France to be warded with the label HQE – Haute Qualité Environmentale. The ecological responsible VIPs like Leonardo DiCaprio or Brad Pitt can check in here with a very clean conscious.